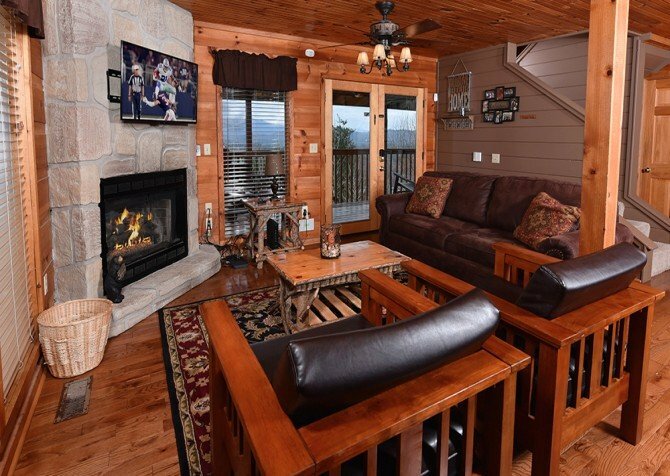 Spread across 3 spacious floors, this 4-bedroom, 3-bathroom cabin with space for up to 8 blends Smoky Mountain charm, family-friendly spaces, the conveniences of home, and modern amenities. 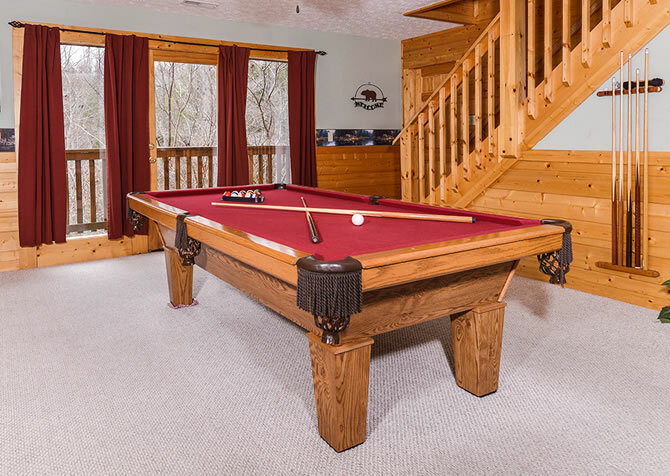 Wood interiors make it cozy inside, lush trees make it serene outside, and awesome amenities inside and out create a space where you can unwind, play, eat, and enjoy quality time in the Great Smoky Mountains. Love the peacefulness of the woods and the conveniences of staying near downtown? Bearadise offers both: serene wooded surroundings and a location just about 1 mile from downtown Gatlinburg. You can spend days playing at area attractions, shopping at the outlets, and eating downtown before unwinding just minutes away at the cabin. 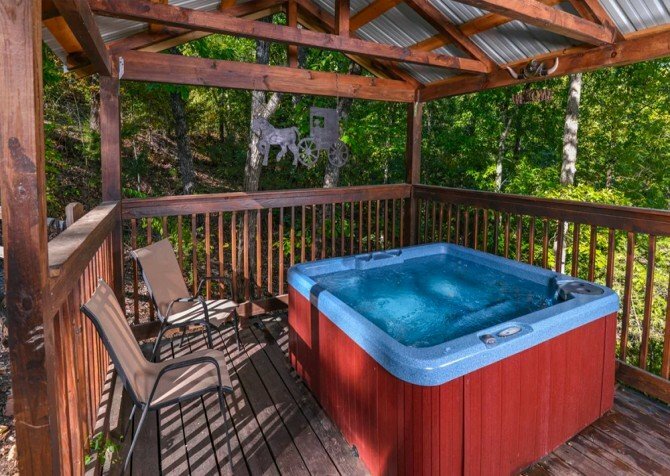 At the cabin, make homemade meals in your fully equipped kitchen, play board games and card games by the fire in the family room, sit down for outdoor meals on the deck, unwind in the hot tub, or cozy up in the living room to watch movies and ball games. At night, retreat to the inviting bedrooms for a peaceful night in the mountains. 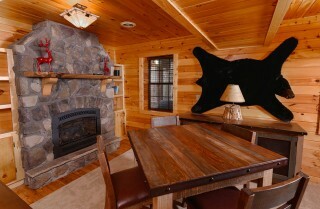 Each space has been created with family and friends in mind, perfect for making lifelong memories in the mountains. Step inside this warm, welcoming living room and feel right at home. Large windows stretch from floor to ceiling along the back wall, framing the lush wooded views and giving you a peek of the deck. 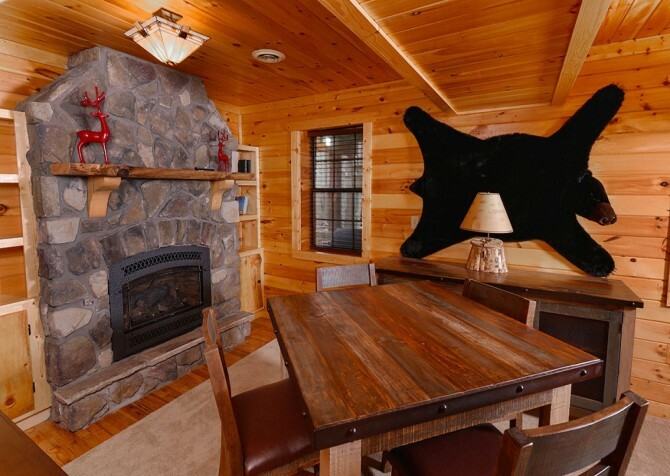 On cool mountain nights, you can cozy up in front of the gas stacked-stone fireplace that stretches to the ceiling. 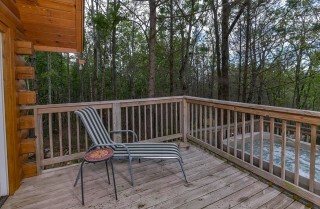 Soak in wooded views and find a comfortable spot on the couch or in one of the chairs to relax. The living room has a big screen TV mounted on the wall, along with a DVD player. You can flip on a cartoon for the kids, turn on the ball game, or make it a movie night with popcorn and drinks! The open kitchen of Bearadise is great for creating family-style meals, keeping leftovers, or just having snacks and drinks on hand at all times. Along with plenty of counter space, the kitchen boasts a dishwasher, stove/oven, microwave, and a large refrigerator and freezer. It’s also equipped with kitchen tools for making meals, a blender and coffeemaker, a toaster, and enough dishes, glassware, and utensils. At the breakfast bar, you can set up a buffet of snacks or holiday favorites, set out some pizza, or just enjoy a cup of coffee before heading out for the day. 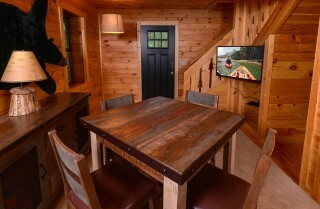 It also offers some extra dining space when you want a group meal in the cabin. If you’re not up for cooking, you can grab some takeout from downtown or even have a special meal created in the cabin by Chef Jeremy of Savory Solutions. It’s mealtime in the cabin! When you don’t feel like going out to eat, or you want a special homemade meal, you’ll have a lovely place to enjoy it at the dining table in Bearadise. The log table has 2 benches and 2 chairs, with seating for 6. Large windows showcase wooded views here, and the fireplace is just steps away. It’s a perfectly cozy place to enjoy a meal and relax. And because it opens to the living room, those relaxing in front of the TV can chat with others grabbing a bite to eat. It’s also a nice place to have a cup of coffee and some donuts in the morning, set out some game-day snacks, or play games. After busy days playing at Dollywood, hiking in the Great Smoky Mountains National Park, shopping and browsing at the Great Smoky Arts & Crafts Community, watching dinner shows, and exploring at area attractions, the 4 cozy bedrooms in Bearadise will be welcome retreats. 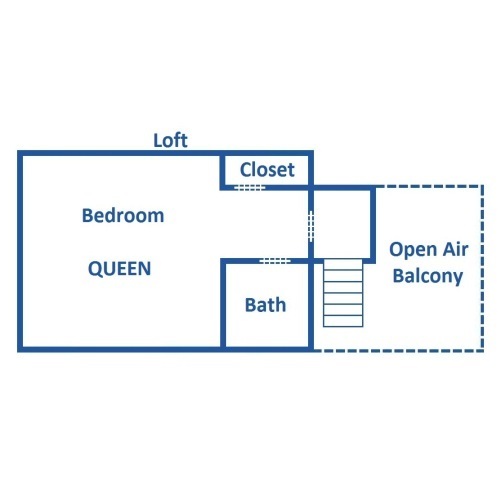 Two bedrooms are located on the entry level, 1 is located on the top floor, 1 is located on the lower level, and the 3 bathrooms are spread across the 3 floors. Each bedroom offers conveniences like bedside tables, lamps, and places to unpack to make you feel more at home. 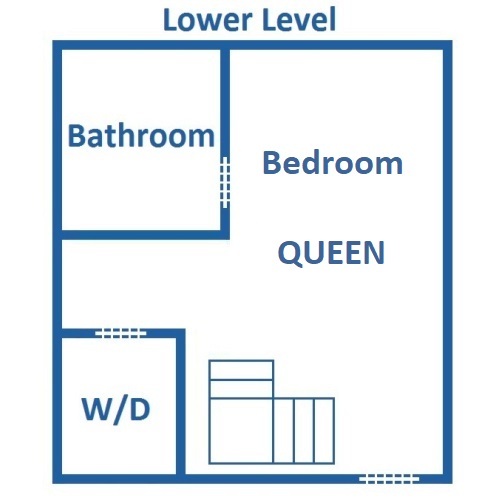 In all, you'll have 3 queen-size beds and 1 full-size bed. An all-wood interior, large area rug, and big stone fireplace create a warm, welcoming space in the family room. It’s a comfortable place to just hang out for games, snacks, or chatting. Bring along board games and cards for a family game night, set up a coloring and crafts station for the kids, or just grab some drinks and relax while watching the flatscreen TV in the corner. If you’re here for the holidays, it can be your gift-wrapping station or dessert table where everyone can snack throughout the day. The family room also has a new queen bed, so you'll have some extra space for guests! The exterior of Bearadise is beautifully landscaped, perfectly blending with the lush wooded surroundings. A stone walkway winds its way up to the cabin, and there are lovely places to relax on the open deck, on the patio, and on the lower level. You can roast marshmallows over the fire pit as you sit back in the Adirondack chairs, cook steaks and burgers on the charcoal grill below the deck, unwind with a soothing soak in the outdoor hot tub, or sit down for a nice outdoor meal at the dining table for 6 on the open deck. There is also a lounge chair with a small table where you can soak up some sun and enjoy a cold drink. Bearadise offers plenty of nice outdoor spaces for guests to spread out and enjoy some time in the great outdoors – without even leaving the cabin! 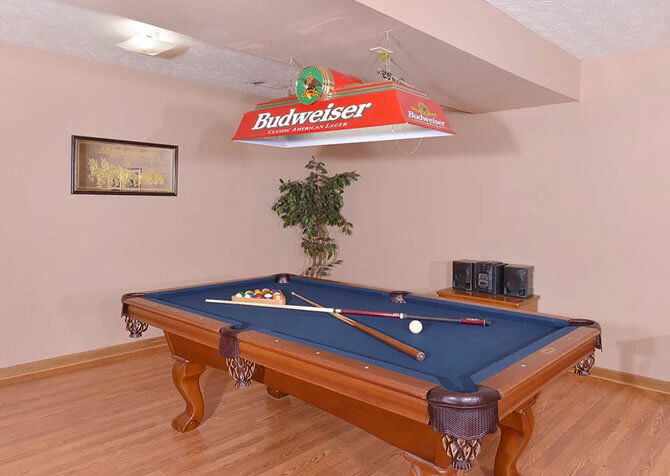 Bearadise offers the conveniences you appreciate at home, plus lots of fun perks. 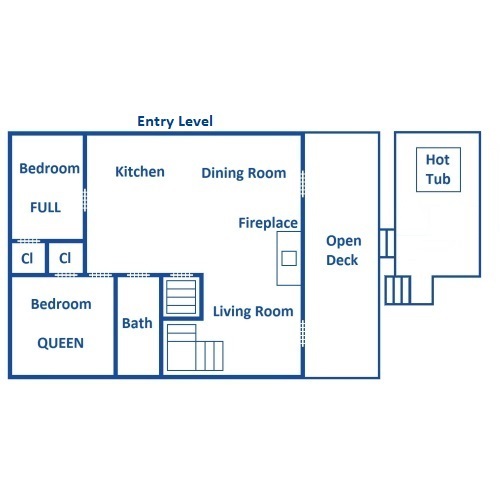 You can stay connected or see what’s happening downtown via our blog with the high-speed internet in the cabin, bring along movies and music for the DVD and CD players, and take advantage of having a washer/dryer in the cabin. There is always something to do in Gatlinburg and Pigeon Forge, from events and attractions to shops and restaurants. If you’re here with kids, check out Dollywood, mini golf and laser tag, go karts, arcades, and Ripley’s attractions in Gatlinburg. Planning a couples’ retreat? You’ll find moonshine distilleries, the Rocky Top Wine Trail, trails in the Great Smoky Mountains National Park, and great dinner shows. Add outlet shops, annual events, and a wide variety of restaurants for a mountain town that has something for everyone. Indoor ice skating year-round, a kids' playground and maze, the alpine slide, skiing and snowbaoarding in winter, an animal encounter, shopping, fresh fudge, OktOBERfest with authentic German bier...enjoy family-friendly fun all throughout the year at this Gatlinburg staple. Arcade games, famous footlong Ogle Dogs, sizzling cheesesteaks...it's family fun in the Smokies at Fannie Farkle's in the heart of downtown Gatlinburg! Along with samples of uniquely flavored moonshine and distillery tours, Ole Smoky Moonshine in downtown Gatlinburg is the place to be for lively music throughout the year! Stop by the Ole Smoky Moonshine Holler for live music and a taste of the Smoky Mountains! "Bearadise was a lovely getaway spot. I booked the cabin for my best friend's bachelorette party and it could not have been more perfect. We enjoyed a cool night in the hot tub, drinking moonshine and chatting. This place was adorable and everyone really enjoyed the views and privacy." "Great cabin! Clean and tidy and good proximity to fun things to do in Gatlinburg." "It is a lovely cabin, up on the mountain with a small view. The hot tub and fire pit were well used, and the home was comfortable. 8.5/10"